Otto’s favorite color is orange. He colors with orange crayons and sings songs about orange. When his aunt sends him an orange package, Otto is thrilled with the orange lamp - even though it’s a little dusty. When Otto cleans off the lamp, a genie appears! 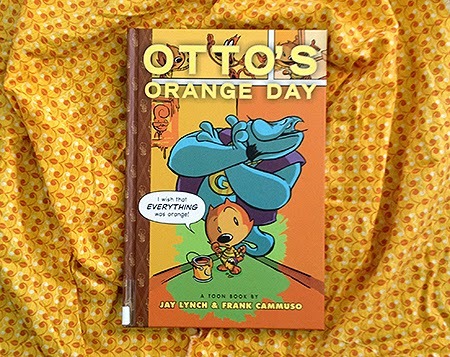 Otto wishes for everything in the world to be his favorite color, but when everything is orange, trouble starts! Can Otto save the orange day? Graphic novels for children are a great idea because the heavily-illustrated books are appealing, and are a great stepping stone from picture books to chapter books. There is a fair amount of dialogue that can be read aloud, but it is still easy for the young reader to follow along with the text. Even if the reader doesn’t know many letters or words, the context clues in the illustrations can help them tell the story and guess what might happen next. It’s also great that graphic novels teach young readers to read panel to panel. Traditional reading is limited to left to right, top to bottom - and of course that’s a crucial thing to know, but learning how to read a panel and take in all that is being told and shown to you is really important, also. It shows young kids that they need to look around and take everything in to get the whole story, instead of just focusing on a word or sentence at a time. My five-year-old stepson picked this book out on his own, and loved hearing it read aloud. I think it was read to his two or three times in a single visit! It’s a book he can look through himself because the pictures are appealing. Since graphic novels depend so much on illustrations, he can tell the story to himself just by looking at the pictures. I thought this book was really cute, too; it’s something I could definitely see as an animated short. There are other Otto books that we’re looking forward to reading, but Toon Books are definitely something we’ll be looking for, regardless of the main character! Booklist’s top 10 graphic novels for youth, ALA’s core collection of graphic novels, Graphic Novel Reporter’s core list of graphic novels for kids, and ALSC’s best graphic novels for children. The back of this book is a great resource for reading graphic novels and comics aloud with children. The book itself is cute and entertaining, but I recommend it for the end pages alone! Tips include: pointing to the character speaking, so the kid can follow along with the expressions and text; get into the story and read the dialogue like a play; talking about the pictures and letting kids guess what’s happening and what will happen next. The TOON Books website has great resources for parents/educators as well as kids. Their book list is broken down according to reading level, so you can make sure you’re getting the best books for your beginning readers! Check it out at toon-books.com, but be prepared to spend a LOT of time exploring! I'm attending the 2019 YA Services Symposium! Happy New Year from Pete the Cat!